The Dynamic Camp is an exciting experience that runs all Summer long for beginner and intermediate players! Pick any week for camp with both Half Day of camp or a Full Day of camp options. Your kids will love the fun of our multi-sport camp. It is a half day/full day camp with a specific sports selections for the activity hour. It will also feature Fun Fridays with games, bouncy castles, water features, and more! If your daughter wants to play lacrosse, soccer, and ninja, then our multisport camp is for her! Centercourt ID Camps are designed to introduce players to our holistic approach towards training. 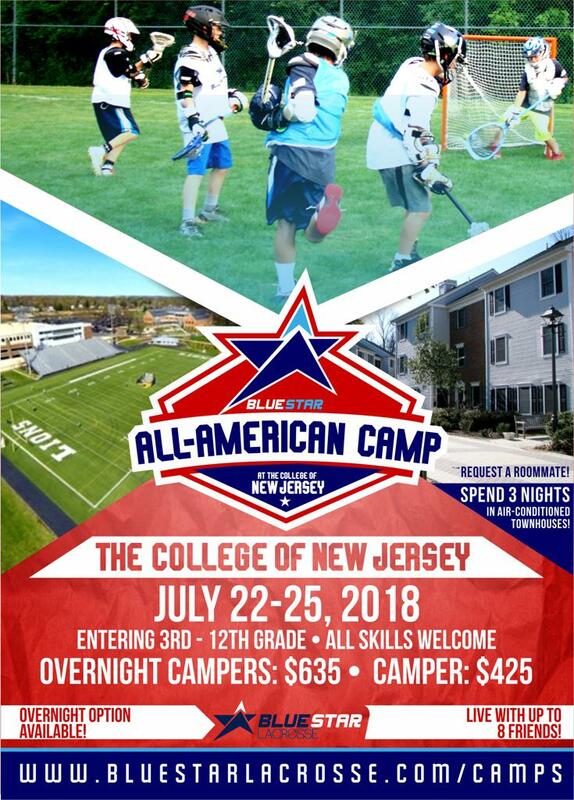 This mini-camps include high-level lacrosse training by our superior coaching staff, strength & conditioning, leadership workshops and sports counseling. It’s an ideal way for coaches to identify athletes who are good fits for CLC and for athletes and families to get to know what Centercourt is all about. Beat the heat and join us this summer at our state-of-the-art, indoor climate-controlled turf facility in Lawrence, NJ! The Centercourt Boys Lacrosse Developmental Camp is offered to boys, ages 8-14, of all skill levels. If you’re a player who is interested in learning from an energetic All-Star coaching staff, this is the camp for you! Our Developmental Lacrosse Camp will focus on all areas of the game and is guaranteed to take every player’s skill-set to the next level. Our high-level coaching staff will consist of current & former collegiate players and coaches that specialize in all positions on the field. Fun-filled competitive drills will challenge players to improve their understanding of the game and ultimately increase their Lacrosse IQ. Top of the line training camp from a D1 coach! Lauren Morton is a top tier coach, and she is coming to Lawrence. Coach Morton will run the fun two to three-day camp focusing on high repetition, fundamental skills. With three lacrosse sessions a day, this camp is great for the lacrosse player looking to improve! This camp will prepare each player to play at their next level with age-appropriate drills and skill groups. Skill groups enable players to advance with their peers, and daily competitions will allow for player growth in a competitive setting. We will also feature a strength, speed and agility sessions with Adapt. For any questions about girls lacrosse, please contact Gabby Moise, Director of Player Development, at . For any questions about Boys lacrosse, please contact Joseph Moore, Facility Manager & Boys Lacrosse Director, . Come Join Lawrence High School Head Coach Dan Brennan, Lawrence Lacrosse Club Coach Jill Foret, and Hopewell Valley HS Head Coach Matthew Foret for a fun week of lacrosse instruction. Camp is for Boys and Girls entering grade 2-9 in fall. Camp will be held at the Hopewell Valley HS Turf field on 6/25-6/29 9:00 am - Noon. Please visit www.rylorlacrosse.com for more information and to register. E-mail us at with any questions. I writing to invite the entire Lawrence Lacrosse Program to the overnight camp this summer. We also have TEAM DISCOUNTS available. My name is Max and I work with GameBreaker Lacrosse, we run summer lacrosse camps all over the country. We are running an overnight camp at the Lawrenceville School from July 23-26, and being that your club is so close to the location, we've created a $40 off coupon code for anyone with your club to use when registering - the code is LAW40. An online brochure for the camp can be found here, this link contains more info about the camp as well as a portal to register. New Players Welcome. Skilled Players – Work On Your Weak Hand. Try A New Position. Play With Your Spring Team Friends. Low Pressure – HAVE FUN PLAYING LACROSSE. This camps provide outstanding instruction in lacrosse! Each camper’s training will include basic skills and development of stick work. Experienced players will be taught advanced skills. Emphasis is on teaching fundamental, individual and team skills. Camper’s will be separated by grade and ability. Campers must bring full equipment. Come join us for an exciting week of Rylor Lacrosse Camp this summer. Camp dates are 6/26-6/30 9am-noon. Camp is for boys and girls entering 2nd-9th grade in fall 2017 (current grade 1-8). Rylor Lacrosse Camp was started in 2010 to provide an opportunity for Lawrence Lacrosse players to develop their lacrosse skills under the direction of some excellent local coaches. Camp also provides Lawrence Lacrosse players the opportunity to be coached by Lawrence High School Head Coach Dan Brennan. Our coaches have extensive background in coaching at the High School as well as at the youth level and coach for a variety of summer all-star programs. In addition to being great lacrosse coaches, our coaches are also teachers and really know how to work with children. Speed Lacrosse, which is co-founded by Casey Powell, gives players a unique opportunity to focus on fundamentals and stick-skills while competing in a fun and competitive setting. With the shortened field, players are forced to move the ball frequently and think fast. Games will be played on a 40yd x 20yd field and will include Box Lacrosse goals. Rather than using an official lacrosse ball, games will be played with a tennis ball. MINIMAL CONTACT ALLOWED! Teams will compete in a 6 Week league; 4 Regular Season weeks followed by 2 Weeks of play-offs. At the end of the 4-week regular season, all teams will be placed in a playoff. The top two teams will compete in a Best-of-Three Championship Series. Teams consist of 5 players; 3 field players (one of which will also serve as temporary goalie while on defense) and 2 subs. No long-poles are allowed on the field. This Camp is a high-level lacrosse camp aimed for boys who are looking to take their game to the next level. 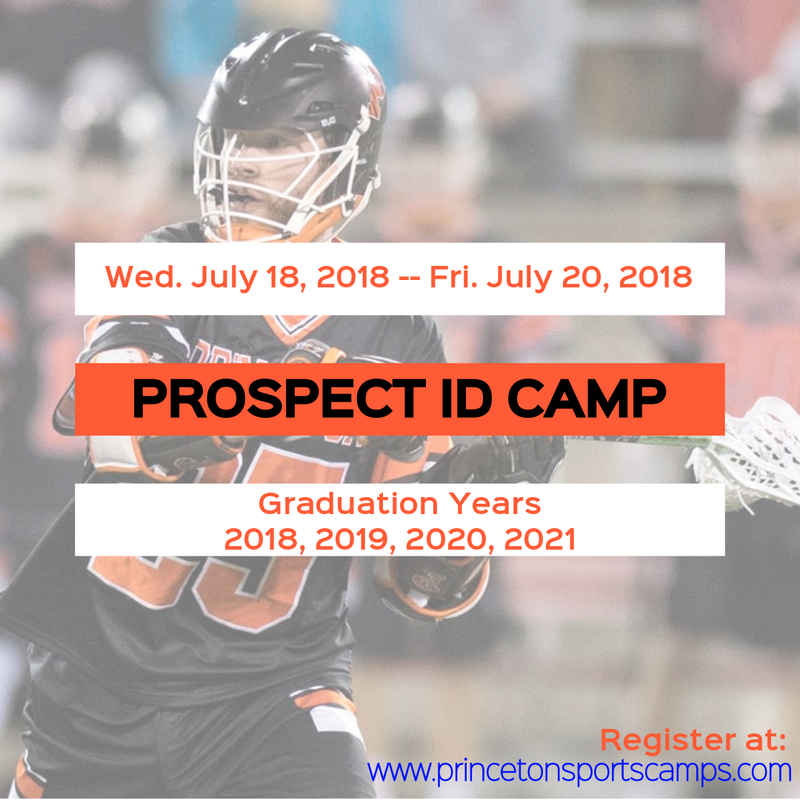 The camp will be directed by Joe Moore (West Windsor-North,NJ, Syracuse ’12) and Pat Young (Ewing, NJ, Maryland ’16/Charlotte Hounds), both of whom have reached the professional level in lacrosse. Strength & Conditioning sessions will be included in each day of the camp and will be run by professional Strength & Conditioning Trainers. Full Equipment Required: Helmet, Stick, Gloves, Arm/Elbow pads, Athletic Support, Cleats/Sneakers, Mouth guard. This is a 4-Day lacrosse & activities camp that will be directed by three high-level, multi-sport athletes. The camp is aimed for the young lacrosse player who is looking to learn the basics of the game and also develop their overall athletic abilities. We will focus on developing camper’s athleticism through lacrosse drills, fun games & competitions and agility drills! Boys & Girls with 0 – 5 years of lacrosse experience are welcome to attend. Full Equipment is required: Boys: Helmet, Stick, Gloves, Arm/Elbow Pads, Athletic Support, Cleats/Sneakers, Mouth guard. Girls: Goggle, Stick, Mouth guard, Cleats/Sneakers. The Summer High School Instructional League is offered for teams and players that are looking to continue their lacrosse growth and development in the off-season. Launching the league right after the conclusion of the Spring Season helps players remain in a lacrosse mindset and physically in shape. All camps, contact Joe Moore with any questions. Registration Discount Extended Until May 15th. Full Price After May 15th. 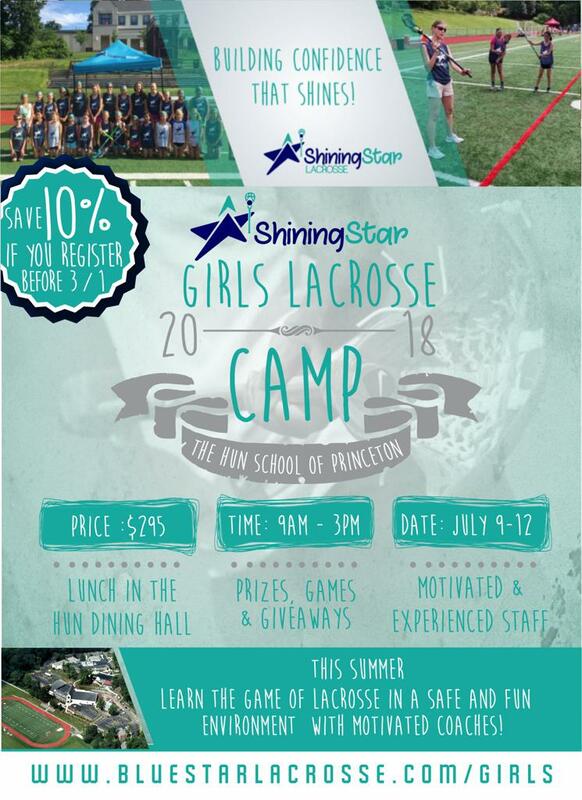 The Shining Star Lacrosse Camp is dedicated to teaching young girls the great game of lacrosse in a fun, safe, and positive environment. Our goal is to have our campers feel successful and confident as lacrosse players and as young women. Beginners will be introduced to lacrosse fundamentals in sound and creative ways. Intermediate players will have opportunities to hone their skills and advance in ability. 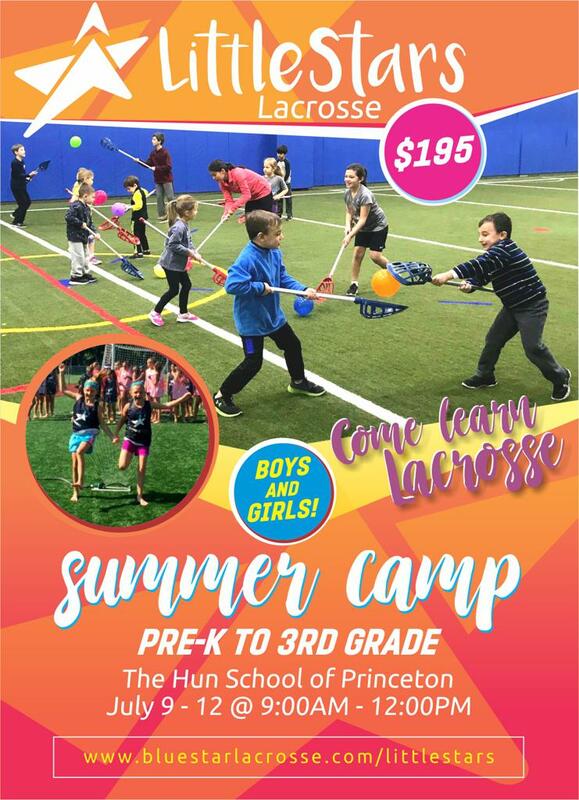 The camp will run from Monday, July 10 through Thursday, July 13, 9:00am - 3:00pm at the Hun School of Princeton, 176 Edgerstoune Road, Princeton, NJ 08540. The camp is for girls grades 3-8. Cost is $295, which includes lunch in the Hun dining hall. Inquiries can be sent to . Blue Star Lacrosse Camps provide individualized instruction for beginners to advanced players. Players will get the instruction and repetitions they need, from fundamentals all the way to college-level skills. Blue Star coaches have over 20+ years of running, managing and coaching lacrosse camps, with hundreds of camps under their belts. 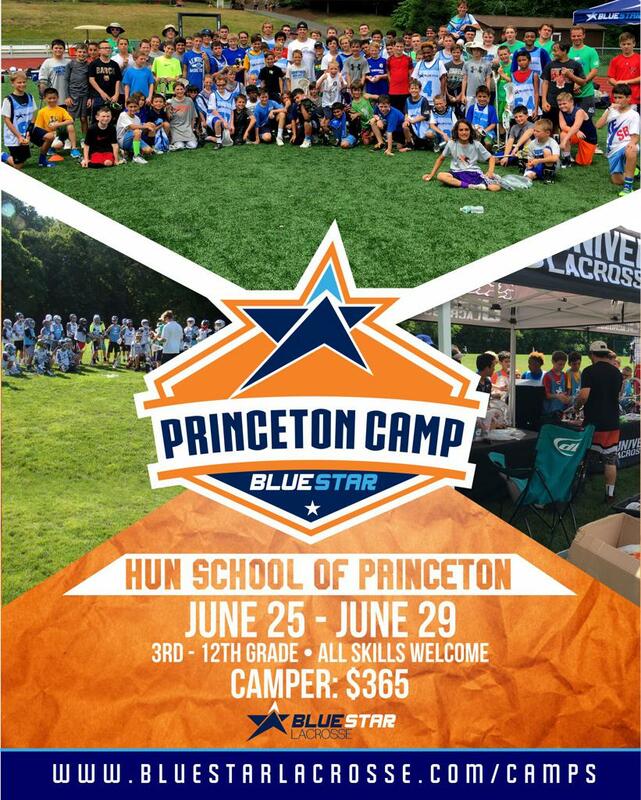 Camps will be located at The Hun School located in Princeton, The Pingry School in Basking Ridge, and The College of New Jersey in Ewing. Summer camp information is up for 2017! Summer lacrosse programs will be holding tryouts for the summer of 2017 in early August. Programs are offered for boys in 3rd grade through high school. Tryouts at the Hun School in Princeton will begin on August 14th. Visit http://www.bluestarlacrosse.com/tryoutdetails for details and to register. Tryouts at Reed Park in Allentown begin on August 6th. Visit http://www.newjerseylacrosseclub.com/ for details and to register. Tryouts at The Pennington School in Pennington will begin on August 2nd, 3rd, 8th and 9th. Visit http://www.teamturnpike.com/Tryouts/index_E.html for details, times and to register. Tryouts at Rutgers Busch Campus in Piscataway will be held on August 21st. Visit http://trilax.com/ for details and to register. Registration is now open for Rylor Lacrosse Camp. New this year, the camp is being expanded to include a boy’s high school program for players entering grades 9-12. This will be in addition to the youth boy’s program for players entering 2nd through 8th grade and the youth girl’s program for players entering 2nd through 9th grade. The camp is located right in Lawrence at the fields at the Lawrence Intermediate School. It will run from August 1st through 5th this year. This camp provides outstanding instruction in lacrosse! Each camper’s training will include basic skills and development of stick work. Experienced players will be taught advanced skills. Emphasis is on teaching fundamental, individual and team skills. Camper’s will be separated by grade and ability. Campers are encouraged to bring full equipment. Tri-State Lacrosse coach, PJ Martin, will be hosting a defensemen focused clinic series at Rutgers. It will be a three part series - 3 x 1.5 hr sessions - that will cover in-depth defensive techniques. For every player that signs up for a Blue Star camp using the code Lawrence1, our club will get at donation back. The players will also receive a free t-shirt if they sign up using the code. Weeknight sessions at West Windsor Community Park starting in June, two days per week. All ages, all skill levels, boys and girls. The middle school and high school programs are game play only. See www.fivestarlax.com for more info or to register. is looking for additional players for their 3-6th grade teams. If you are interested in trying out you can contact Jody Turco at or just go to trilax.siplay.com and register for BOYS ALLSTAR TRYOUTS (RUTGERS). At Learn to Lax, we will have a coaching staff consisting of players and coaches from top level schools and will ensure a low camper-to-staff ratio. The camp will be open to girls entering 3rd-9th grade (as of Sept 2016). There are no requirements on skill level or experience to get involved in the camp. We have a lot to teach the girls across all positions and welcome all athletes. The camp will run from 9:00am-1:00pm from July 18-21st and will cost $260 per camper. The Lacrosse Academy at Fairleigh Dickinson University is a youth camp run by Pat Scarpello, fellow collegiate coaches, and both Division 1 and Division 3 players. Campers can register as a team or individually. I appreciate your time and hope your spring season is going well. Tri-State: Tryouts are Sunday, August 30th. Team Turnpike: Tryouts are 08/19, 08/20 and 08/23. New Jersey Lacrosse Club: Tryouts are 8/26 and 8/29. Leading Edge: Tryouts are 8/29, 8/30 or 9/1. The Long Island Girls LAX Recruiting Showcase is an amazing opportunity for class of 2016-2020 (rising seniors through rising 8th graders) to be seen by top college recruiters from Divisions I, II & III! 69 College Coaches attended last year's Showcase. We expect over 80 this year. Registration is on an individual basis - this is not a team Showcase. Visit www.kjathletics.com. How It Works: Players are teamed up with other girls from throughout the area and placed on “light” teams of approximately 19 to ensure optimal play time. This is a True Showcase – only 2 games are played at a time on adjacent turf fields creating the perfect recruiting platform with coaches in between the fields focusing on both games. Coaches get detailed bios of all players. Optional College Coach Clinic & Practice: The day before the Showcase players can attend a Drills & Skills Instructional Session headed by college coaches and meet their team and coach for a practice. Fee: $150. Visit www.kjathletics.com or complete flyer. (631) 896-2211 . The Boys Red Storm Showcase Clinic @ St. John's University is a great opportunity for class of 2016-2019 boys lacrosse players to gain skill instruction and participate in front of college coaches from the northeast and throughout the nation! 55 Coaches from Divisions I, II & III attended last year. How It Works: Players are teamed up with other boys from throughout the area and placed on “light” teams of approximately 20 to ensure optimal play time. This is a True Showcase Clinic – Players receive skill instruction from top area coaches and only 2 games are played at a time on turf! This ensures everyone gets seen. Instructional Session: Included is a Drills & Skills Clinic headed by college coaches. This is great opportunity to gain valuable skills from some of the country's best coaches. Also, an NCAA Educational Session is provided. Fee: $200. Visit www.kjathletics.com or complete flyer. (631) 896-2211 . Don't miss this great opportunity to train with some of the BEST players in lacrosse! Each day will be based on a specific skill such as Draws, Transition, Offense and Defense. On Wednesday of camp we will have our unique Combine Day which will be run by, Alex Marino who is the Director of LacrosseFit and the Assistant Director of Strength and Conditioning for United Lacrosse. Thank you again for passing this along to your players! Please call me with any questions!! We are very pleased to present the Thompson Brothers Clinic again this summer! Philadelphia Wings Captain and HGP Alumni Brett Manney will be a Guest Counselor. Past HGP Alums who compete at the Collegiate level will also be there as counselors. They will offer expertise in defense, dodging, shooting, faceoffs, goalie play and stick skills. Campers will get to experience the HGP Varsity Experience learning from counselor demos, video and competition. Register through this HGP Lacrosse Camp link. The camp will be designed to give players, ages 10-15, a better understanding of the game of lacrosse in a fun and exciting manner. All skills and drills will be age appropriate and will help foster the fundamentals and demands of the sport in a positive way. Skills emphasized will include individual stick work, agility and fitness training, shooting fundamentals, communication activities, multiple player concepts, game situations and team building. 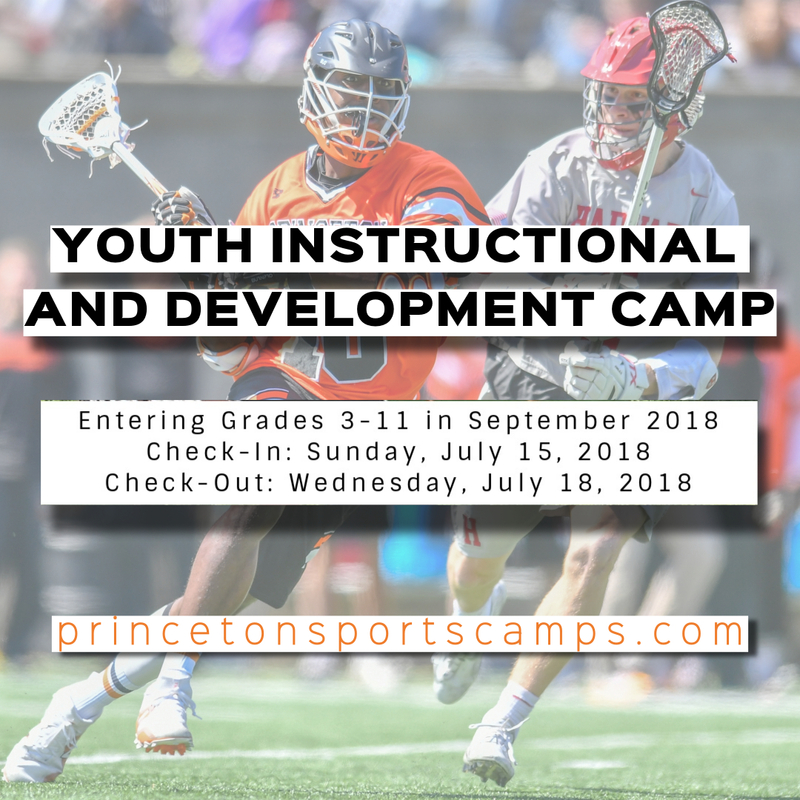 Pennington School varsity coaching staff and current high school and college players will be conducting a fun and competitive camp designed to improve individual skills and get a better understanding of the game of lacrosse for players ages 10–15. Campers will learn the skills that it takes to play this fast-paced and exciting game at the middle school and high school level. Skill contests with prizes on Friday. Players from all area programs are welcome! Camps are $295/week for 1-week sessions. Fee includes lunch daily. Before- and after-camp care will be available at an additional cost. This is Casey Powell, and I wanted to let you know about the GameBreaker Lacrosse Camp that I will be directing this summer at The Lawrenceville School. The camp is open to boys ages 8-17 and campers will be divided by age and ability. GameBreaker Lacrosse operates summer camps at over 120 locations nationwide and over the past 15 years more than 65,000 players have attended these camps to improve and have fun. We look forward to the opportunity to work with the players in your program this summer. This year’s camp dates are July 27 – July 30, with overnight and extended day camp options. As a coach and player, my life has been dedicated to lacrosse. I grew up playing the sport in Upstate New York, before starting my collegiate career at Syracuse University. I was fortunate to play with great teammates there, making my experience a memorable one. During my four years, I was voted an All-American each season, as well as being named the NCAA Most Outstanding Player, two of those seasons. After school, I began my Professional career in the MLL and NLL, winning the Most Valuable Player in each. Most importantly, I have learned the values of hard work and leadership and how to be a great teammate. I look forward to sharing all of these life skills with New Jersey’s lacrosse players this summer. My staff will include college coaches, high school coaches and NCAA players. All of these coaches are dedicated to the individual development of each camper and serve as great role models to the campers. We are a teaching camp that also provides competitive scrimmaging opportunities – all in a fun and positive atmosphere. Our entire staff takes pride in the improvement of each camper that we work with during the camp. There is a camp brochure that can be downloaded here. To set your team up with a group discount, please email us at and be sure to put in the subject line: Group Coupon Code Request. I hope you are having a great season! If you have any questions, please don’t hesitate to contact us at 800-944-7112 or . Dates: Aug 3rd-Aug 7th @ Rider U. Experience the excitement of the United States' fastest growing sport at Pulse Premier Lacrosse Camps. Pulse's signature advanced training curriculum's feature the most up to date techniques in lacrosse education that focus on both technical and tactical strategy. Low coach-to-player ratios ensures lacrosse enthusiasts of all skill levels experience an unparalleled professional environment that encourages athletes to thrive and reach the pinnacle of their game. Designed by our team of highly-qualified premier coaches and delivered at superior facilities, Pulse Lacrosse programs are unrivaled in their ability to foster growth and success in young athletes. Check back here for a flyer and registration discount code. Registration Now Open for 2015 Summer Camp! EARLY REGISTRATION DISCOUNT - Register before 6/15/15 to save $30. Garden State Elite has roster spots available on its 4th and 5th grade travel team for this coming summer. Participate in two summer tournaments in NJ in June and one in PA in July. Field 5, West Windsor Community Park, 193 Princeton Hightstown Road, West Windsor, NJ. Enter Park through main entrance, pass pool and skate park on right. Park in lot on right by the power lines. You must sign up for a try out at www.gardenstateelite.com, click on "2015 Garden State ELITE Tryouts". Tryout fee is $75. Grad Years 2022/23 summer fee $750 for three tournaments. Questions? Email or call 609 638 7825. School ends....what plans do you have for your son after the school year is over? Why not stay active and get to a camp right after! Check out our camp that starts the last full week of June! This camp provides outstanding instruction in lacrosse. Each camper's training will include basic skills and development of stick work. Experienced players will be taught advanced skills. Emphasis is on teaching fundamental, individual and team skills. Camper’s will be separated by grade and ability. Campers are to bring full equipment. Equipment: Each camper is to provide their own helmet, stick, gloves, shoes (preferably cleats), athletic supporter and mouthpiece.